When we moved away from Arizona two years ago I vowed I would be the cool aunt/sister/daughter/granddaughter that would be good at mailing cards and gifts to my family back home in Arizona. But I am working on it. And this fun birthday balloon idea is going in my cool aunt arsenal. This fun box is perfect for mailing because it is super light weight. Inside are balloons, each one with a dollar inside. You could even throw confetti in some to mix it up. This is such a fun way to wish someone a Happy Birthday from far away. 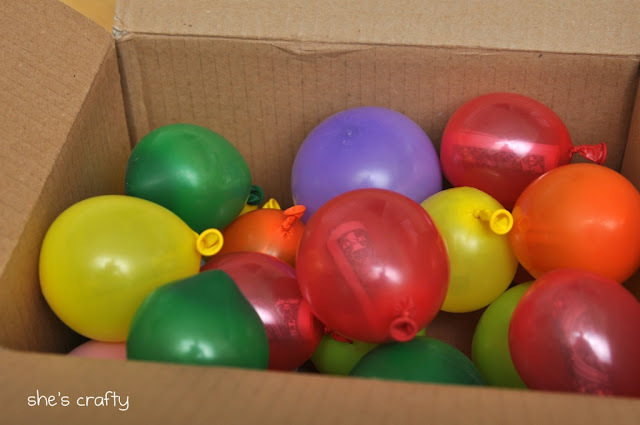 You can check out all of the details of the box of birthday balloons, and other great ideas, over at She's Crafty. Thank you for the shout out about my birthday balloons!! This is absolutely one of the cutest and most creative bday ideas I have seen! Thanks for sharing. I love this! It would be super cheap to ship, and my kids would have a ball with the balloons!